Rollerscript was envisioned through scripting out variations of each character by hand with the help of a roller pen prior to undergoing the scanning and digitising process. The Rollerscript is, effectively, a contemporary adaptation of Olicana whose letterforms were outlined via a nibbed pen and ink. The handwriting may change as per the type of instrument you plan to use. 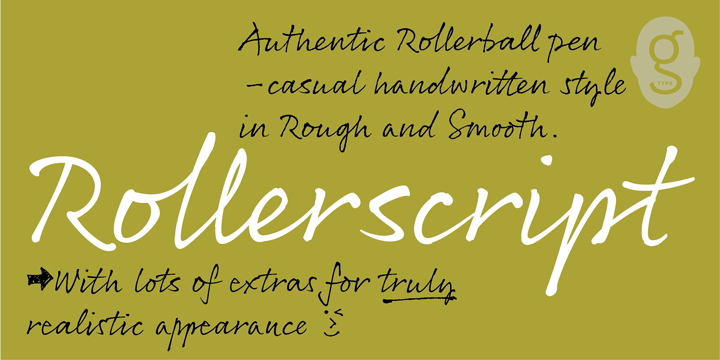 Rollerscript ensures a casual and informal effect as compared to Olicana yet just as realistic. The addition of many underlines, sketched icons, emoticons and arrows provide an extra boost to the font.